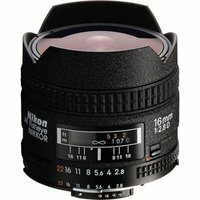 Full frame 180 degree fisheye coverage with Nikon's advanced D-type autofocus lens technology. Close-Range Correction (CRC) system provides high performance at both near and far focusing distances. Nikon Super Integrated Coating for minimised flare and ghost, providing good colour balance. Features an integral lens hood.